The number of homeless single adults in the New York City shelter system has drastically risen over the past year, defying usual trends and reaching a level not seen in over two decades. 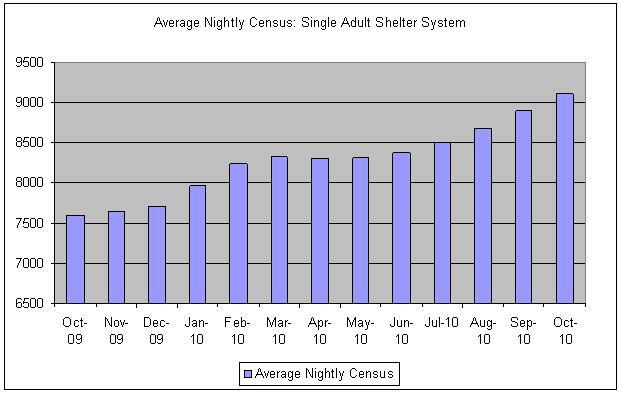 The average nightly shelter census for single adult men and women in October 2009 was 7,603. As of this month, October 2010, that number is now 9,114–an increase of 1,511 individuals over the course of just one year. Perhaps even more disturbing is the steady and continual climb throughout the year. Data going back decades shows that the number of homeless single adults usually drops during the summer months (due to the warmer weather) and then rises again in the winter months. But this past year, the census stayed virtually the same from March to June and then actually increased in July and August. This unusual occurrence raises significant concerns about the coming winter months and how high the numbers may continue to climb. October’s average nightly census is higher than any other time since 1989, when there were 9,342 homeless men and women in the City’s shelter system each night. So far, in 2010, we are seeing the highest number of homeless single men and women in over two decades! These numbers speak to the ongoing economic crisis that many low and middle-income New Yorkers are facing, including joblessness, a lack of affordable housing, and stagnating wages. As the court-appointed monitors of the adult shelter system under Callahan v. Carey, the Coalition will continue to monitor the ongoing capacity crunch in our City’s shelters and continue to protect the right to shelter for all individuals finding themselves in a crisis of homelessness. *Note: Data is from the Department of Homeless Services Daily Adult Shelter Statistics and includes Safe Haven and Veterans statistics. City data shows that, even in the midst of the lingering economic crisis, the City is denying shelter to homeless families at a higher rate. The City’s homeless services commissioner, Seth Diamond, was asked repeatedly by City Councilmembers to explain the worsening shelter denial rate, but he refused to do so. Nevertheless, City data has long shown how faulty and error-prone the City’s eligibility review process is. 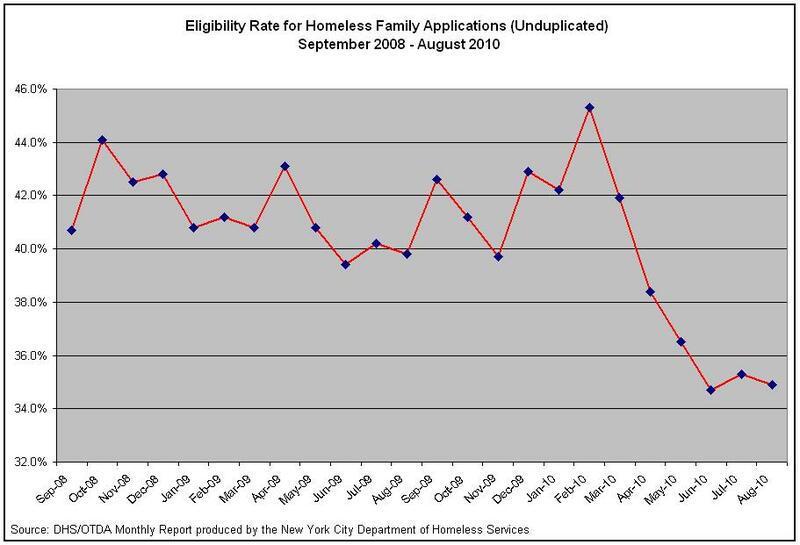 Indeed, as noted at the hearing, in FY 2010, of all homeless families ultimately deemed eligible for shelter (14,545 families), 40.7% of them (5,920 families) filed two or more applications. DHS Commissioner Diamond also could not explain why thousands of families that even the City acknowledges are homeless were forced to apply multiple times in order to obtain emergency shelter. The New York City Council held an important hearing about the problems homeless families confront when seeking emergency shelter – and how the City wrongfully denies shelter to families in crisis. Yesterday’s hearing, held jointly by the General Welfare and Public Housing Committees of the City Council, focused on the problems thousands of homeless families face when the City illegally denies them shelter claiming — falsely — that the families can live with relatives or friends in subsidized housing. As Public Housing Committee Chair Rosie Mendez noted, housing programs administered by the New York City Housing Authority (NYCHA) – including public housing and Section 8 apartments – are governed by strict rules about who can live in the housing units, rules that include occupancy standards and prohibitions on residents with certain criminal convictions. Violating those rules can result in vulnerable families losing their housing subsidies and ultimately losing their home. Nevertheless, as General Welfare Committee Chair Annabel Palma noted, the NYC Department of Homeless Services (DHS) routinely deems homeless families “ineligible” for shelter claiming that they can live with other families in NYCHA-administered housing – even when the tenants do not have NYCHA approval, refuse to request such approval, or simply refuse to allow the homeless family into their homes. The highlight of the hearing came when Councilmember Brad Lander pressed DHS Commissioner Seth Diamond to explain why, in the midst of the lingering economic crisis, the rate at which DHS deems families eligible for shelter has plummeted this year. Indeed, City data show that the percentage of families applying for shelter that is deemed eligible has fallen from 42 percent in March of this year to less than 35 percent in June, and then remained at that level in July and August (see our companion blog post here). Despite Lander’s repeated questions, Diamond refused to explain the worsening shelter denial rate for homeless families. However, Diamond’s opaque, often-times frustrating testimony, as well as more straightforward testimony from NYCHA Deputy General Manager Gloria Finkelman, underscored the failure of DHS to ensure that other housing resources are genuinely available and suitable when families are deemed ineligible for shelter — the standard enshrined in the landmark 2008 Boston v. City of New York final judgment. It would be against housing policy and standards to allow 6 individuals to reside in this dwelling unit causing an overcrowded situation. We would not approve a request of this nature. [The primary tenant] requested permission for her daughter [ } and 3 children to reside in her apartment which has been denied due to creating an over crowding situation which is against housing policy and will cause immediate lease termination if found in violation. (Emphasis in original.) Even with this unequivocal documentation, DHS continued to find this family ineligible for shelter on the ground that they could double up in the NYCHA apartment. Two State administrative hearings did not change that result. During the shelter re-application process, the family was placed in a roach-infested shelter unit. All four family members required emergency room treatment as their health conditions deteriorated, and the four-year-old was admitted to the hospital after suffering a severe asthma attack. Ms. Lee missed work repeatedly and was in danger of losing her job. Her son, previously an excellent student, had to miss days of school while the family applied and re-applied at Path, and his school performance suffered. Finally, after being found ineligible for shelter for two months, Ms. Lee gave up applying. Because her mother would not take her back into her NYCHA apartment, Ms. Lee had no choice but to double up her family in a single room with two adult relatives. In that room, two adults sleep in one bed, while Ms. Lee shares the other bed with her three children. The family eats their meals in that room, which also contains their refrigerator. Not surprising, Ms. Lee’s son’s asthma has continued to worsen while living with five other people in a single room, and he has again required hospital treatment. Nevertheless, based on her two-month experience of being denied shelter, Ms. Lee has determined that it is better for her family to live in the severely overcrowded conditions where she is than to subject her family further to the grueling shelter application process. DHS succeeded in driving this family away. But the City will pay in terms of the increased hospital costs for this family and the foreseeable long-term effects that this traumatic and unsafe experience will have on the medical conditions and developmental and educational outcomes for these children.